Michel Doneda’s latest is a play on Everybody Digs Bill Evans, complete with quotes from other famous soprano players scrawled across the cover. The similarities end there, however, with this Everybody Digs being solo soprano sax recorded in the resonant La Chapelle De La Planques, a Romanesque church in Tanus, France. It’s difficult to talk about Doneda’s music. Terms like “extended technique” cause him to bristle—in an interview with Sam Newsome, he objected to the term because it “it standardizes an approach that is very personal.” Certainly no offense was intended, but even in grappling with language to adequately describe his methods, it’s easy to accidentally fence him in, to define him as some sort of negative space that’s characterized by what he isn’t. Partway down the cover, Gianni Mimmo says Doneda “stands on the threshold that opens to the very flesh of the sound.” This quote—and indeed, the performance itself—brings to my mind Doneda’s fellow Frenchman Pierre Schaeffer, who devoted much thought to addressing how we perceive and are effected by sound and music. Schaeffer once wrote that the musician lives “in an original world which he studies for itself, the world of musical perceptions.” Doneda puts us closer to that inner world of the musician’s perception, closer to the sound itself, which he follows with diligence and curiosity. On Everybody Digs, Doneda explores high frequencies and using just enough breath to generate a tone. Often, he seems to be directing air past the mouthpiece, rather than through it. The recording is low-volume, extremely intimate—you can account for nearly every molecule of air that’s pulled into his lungs and then pushed out through the horn. You become aware not only of the tangible substance of sound, of air as a moving, churning medium, but also of your own body, the cadence of your breathing. There are a lot of adjectives that can be ventured while working through the performance on Everybody Digs: subterranean, microscopic, eerie, obsessive. But perhaps the one that makes the most sense, that doesn’t feel strained or flimsy, is the one that resonates the most with Doneda himself: personal. 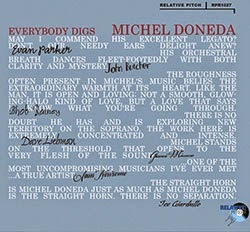 For over four decades now, Doneda has been in a personal—even private—dialogue with the soprano saxophone, and as Everybody Digs Michel Doneda gorgeously reveals, it’s a relationship he’s still coming to terms with.